Copenhagen, Denmark's capital and Scandinavia's largest city, has plenty to offer the most ambitious sightseer: world-class museums, a stately Renaissance castle, a dazzling royal palace…and yet one of my favorite Copenhagen activities is to simply stroll the streets tuning into the little details of everyday life here. After a day spent wandering the canals, parks, and shop-lined boulevards — whether on foot or cycling along the city's generous bike lanes — you'll feel right at home. For the tourist, Copenhagen is compact. The train station, National Museum, Tivoli amusement park, and City Hall huddle together around Rådhuspladsen (City Hall Square), the bustling heart of Copenhagen. It's also the top of the pedestrian thoroughfare called Strøget, a series of lively streets and inviting squares that stretches through the heart of the old town. It leads directly to the salty mini-harbor of Nyhavn, just 15 minutes away — but why rush it? Established in 1962, Strøget was Europe's first major pedestrian boulevard. Walking here now, I love taking in the mix of cobbled cuteness and modern bustle. Even with a million people, the city feels remarkably hyggelig — the Danish version of "cozy," an aesthetic highly prized here. Danes have a knack for enjoying everyday experiences, and their capital is the best place to sample the Danish good life. Copenhageners somehow manage to exude orderliness without being rigid — the whole city emits a sense of balance, and a general calm. 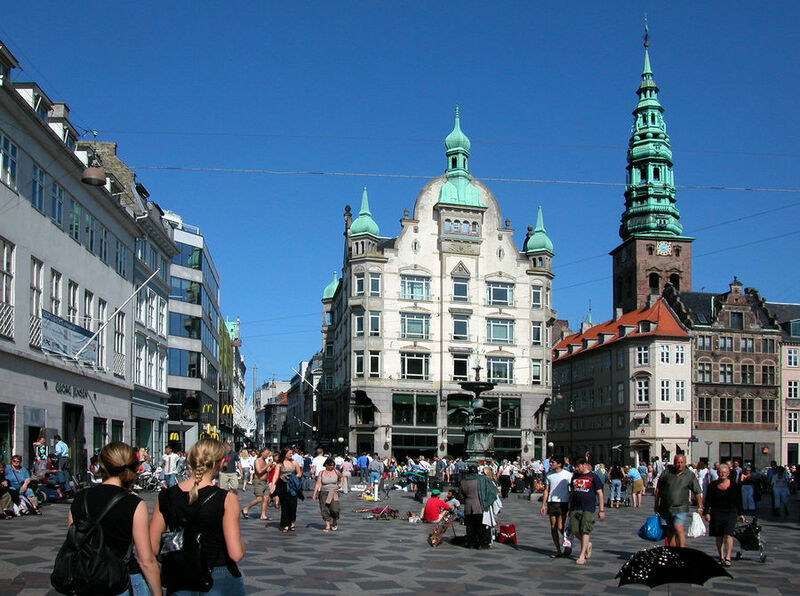 Strøget leads right through the area that had once been the køben (merchant's) havn (harbor) — hence the city's name. As this is a particularly good place to sample Denmark's enticing open-faced sandwiches, I drop into a no-name, family-run shop to grab some smorrebrød to go. These elegant sandwiches cost a fortune in restaurants, but many street-corner shops sell them for less than $5 each. Tradition calls for three sandwich courses: herring first, then meat, and then cheese. Before long I'm in Nyhavn, a formerly sleazy sailors' quarter that's now a comfy people zone centered around its canal. A few lonely tattoo parlors and smoky taverns stubbornly defend their salty turf against a rising tide of trendy, expensive cafés. Meandering along the promenade slowly enough to take in all its ice-cream-licking ambience, I notice that glamorous sailboats fill the canal. Any historic sloop is welcome to moor here, temporarily joining the ever-changing fleet of leisure boats, a scene of modern-day Vikings gone soft. Young Danish body-builders showing off muscles, tans, and tattoos clog the waterside, working their way through cases of local beer. The scene is off-putting to many tourists who don't realize that, in a land with astronomical taxes on serving alcohol in bars, "picnic drinking" is the only affordable way for young Danes to go out for a few beers. I consider the outdoor beer consumption in Denmark no different than the consumption in an English pub…just without the building. For a quarter of what you'd pay in a bar, you can drop by a little kiosk a block from the wharf to grab a cold beer, then join the scene on one of the harborview benches. 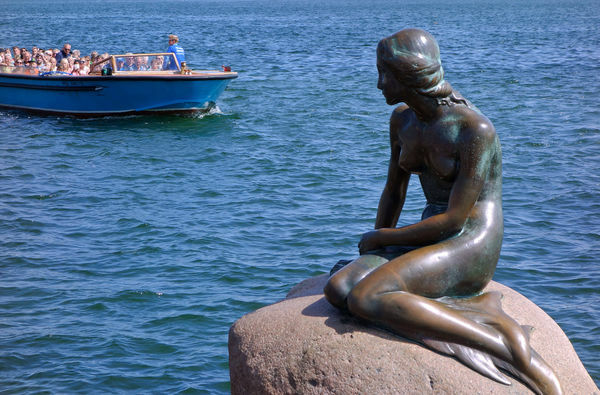 And just a few blocks farther along the water, the city's most famous citizen, the Little Mermaid, sits demurely on her rock (no beer for her), posing patiently for all the tour groups and wondering when a prankster will steal her head again. 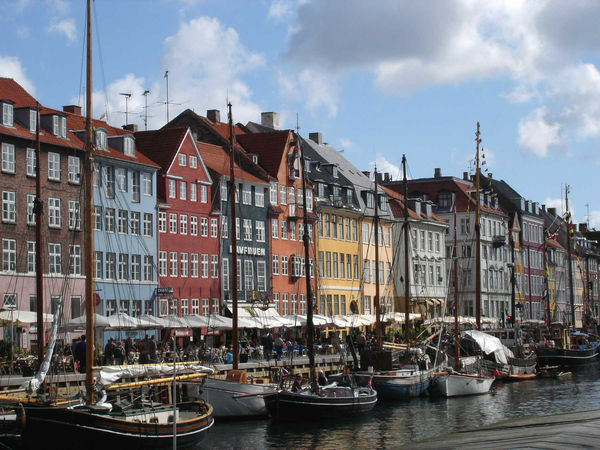 From Nyhavn you can easily cross the harbor on the retractable, ultramodern Inderhavnsbroen pedestrian bridge to land on the island of Christianshavn. With pleasant canalside walks and trendy restaurants, this former merchants' district is one of the city's most delightful neighborhoods to explore. Christianshavn's centerpiece is Our Savior's Church, with a unique exterior spiral staircase that rewards those who climb it with commanding views of the city. And down the street is the famous socialist-utopia commune, Christiania. Since 1971, this "free city" has been home to a mishmash of idealists, hippies, and potheads. Visitors who venture beyond its overtouristed main drag find a ramshackle world of moats and earthen ramparts, cozy tea houses, carpenter shops, hippie villas, children's playgrounds, peaceful lanes, and people who believe that "to be normal is to be in a straitjacket." But today I'm heading in the opposite direction, away from the water, to dive back into the middle of the city. It's afternoon now, and I notice Danes gathering at pølsevogne (sausage wagons) for munchies and pølsesnak — the local slang for empty chatter (literally, "sausage talk"). These wiener-mobiles aren't just a culinary institution, but examples of Denmark's social care: Most are licensed to people who've had difficulty finding other jobs. As they gain seniority, vendors are promoted from these "cold feet cafés" to work at more central locations. The deeper I go beyond Strøget, the more I find myself plunging into a city of lovely spires and public spaces. The city's once-formidable fortified walls and moat systems have morphed into a ring of lush parks and tranquil lakes. The most royal public space is the King's Garden surrounding the Renaissance-era Rosenborg Castle, where sun-loving Danes soak in the long days of their short summer. If your rambles whet your appetite for Danish history, make time for the excellent and curiously enjoyable National Museum (back near Rådhuspladsen), which traces the Danish civilization from its ancient beginnings. It's packed with fascinating exhibits: You can see the city's prehistoric passage graves, mummified Viking bodies with armor and weapons, the rustic yet mysteriously exquisite 2,000 year old Gunderstrup Cauldron, mead drinking horns, and ancient lur horns that still can be played. With so much to enjoy before dark, I like to wrap up a Copenhagen day at the historic Tivoli Gardens, Europe's most famous amusement park. It's been operating since 1843, when the king cleverly quelled a French Revolution–type thirst for democracy by giving his people Europe's first great public amusement park. Open all day and late into the night, it's a festival of entertainment — 20 acres, 100,000 lanterns, and countless calories. It's a joy to get lost in this wonderland of rides, restaurants, music, and games. I find it worth the admission just to see Danes — young and old — at play. Tivoli, so comfortable with its identity, is happily Danish, and wonderfully Copenhagen.